It was her immense courage and determination to live life to the full that touched the hearts of thousands of people who followed Esme’s Adventure on Facebook. When she made a wish list of people to meet and things to do the response was just amazing. She met sporting heroes Sir Chris Hoy, Dame Ellen MacArthur and Andy Murray and singers Amy Macdonald and Emeli Sandé. She went hot air ballooning, sailing and snow biking and took part in fashion shows – all the while raising awareness and money for the Teenage Cancer Trust. Also on her wish list was to “have harp tunes written for me to make a book and sell for charity”. 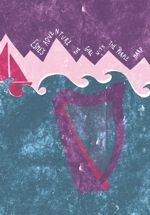 It is great to see this wish fulfilled and provides a unique compilation of tunes for the clarsach composed by some of Scotland’s foremost harp players who were inspired by Esme’s Adventure. The Teenage Cancer Trust believes that teenagers shouldn’t have to stop being teenagers just because they have cancer. The charity has funded, built and now maintains 28 specialist units in NHS hospitals across the UK where young people can be treated together, by teenage cancer experts, in an environment suited to their needs. Esme was treated in the Teenage Cancer Trust units in Edinburgh and Newcastle. Proceeds from the sale of this book will go equally to: The Teenage Cancer Trust and The Clarsach Society. Rachel is a harpist-composer who was brought up in Ullapool but is now based in Glasgow. She has two solo albums to her name and performs regularly throughout the UK, Europe and further afield both as a solo musician and with the Rachel Hair Trio. Jennifer is a National Mòd Gold Medallist, has reached the final of the BBC Scotland Young Traditional Musician of the Year and became an ambassador for VisitScotland after playing the clarsach at Madonna’s wedding. Debbie is based in the Isle of Lewis and composed this tune after reading Esme’s Facebook page. Màiri is a clarsach player and Gaelic singer now based in the Isle of Lewis where she has a very busy teaching and performing career and also conducts the Carloway Gaelic Choir. Her debut solo album 'Ceòl is Òrain' features her composition 'Prayer' which she played at Esme's funeral service. Amy is currently working towards her BA Hons Music Performance and collaborated on a project for the 2014 Edinburgh International Harp Festival with Fiona Rutherford and Drake Music Scotland creating opportunities for people with disabilities to learn, compose and perform music independently. 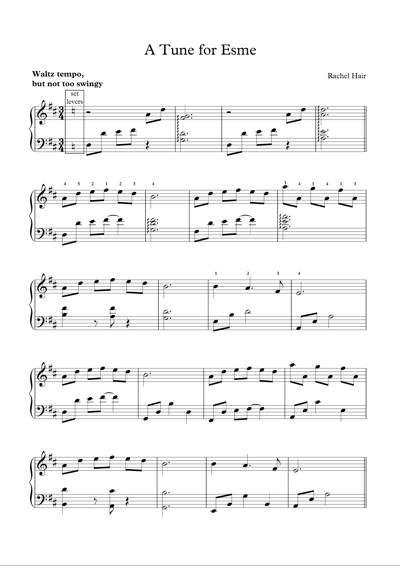 Amy chose this traditional tune because it was a real favourite of Esme’s. This renowned harp duo, formed in 1981, has been instrumental in bringing Scottish harp music and Gaelic and Scots song to an ever-widening audience. They were inducted into the Scottish Traditional Music Hall of Fame in 2013. The inspiration for their tune was the pictures of Esme in a hot air balloon flying over Perth-shire on a sunny May evening. Rosie worked as a clarsach player and teacher in the Edinburgh area for a number of years and first introduced Esme to the harp giving her lessons from the age of 9. Rosie currently tutors Art and English in Hampshire. Elinor has recently graduated from the Royal Conservatoire of Scotland with a BA (Hons) in Scottish Traditional Music with clàrsach as first study. She is now studying for a Postgraduate Diploma in Composition at the Royal Welsh College of Music and Drama alongside becoming a popular performer and teacher. Fiona gained degrees in Composition at Dartington College of Arts and Edinburgh University and has written for theatre and film. She was Esme’s harp teacher for several years and her piece ‘Sunflower’ was inspired by the beautiful poem written for Esme by her friend Eilidh. 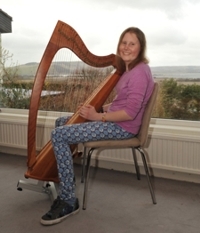 Mairi was inspired to take up the small harp after reading ‘The Healing Sound of Music’ and has been involved in mental health support work for a number of years. Karen is a composer, tutor and performer with an international career and a particular interest in pipe music, world music and multi-cultural projects. This tune was inspired by the picture of Esme with her new purple harp that arrived just days before she died. Gwen's busy and varied career involves teaching the clarsach at the Glasgow Gaelic School, performing with folk duo Tornish and the Welsh project 10 Mewn Bws, as well as chamber and solo work. Isobel is the musical director of Na Clàrsairean (Gaelic for The Harpers) - the orchestra of the Edinburgh Branch of the Clarsach Society of which Esme was a member for a number of years. Isobel was inspired to write this tune after seeing the wonderful photo of Esme on a bicycle with Sir Chris Hoy.